Team-Dystopia has been dormant in the marketplace for a while, but we've recently released Weapons Cache 1 and Weapons Cache 2 here at DAZ 3D. Here is a link to a quick low-resolution animation I did to show how versatile one of the weapons in our package can be. The Baradum Assault Rifle weapons system is just one of the many weapons we have bundled together into these packages. We've got a beam weapon, a mini-gun, an anti-materiel sniper rifle, a compact close-quarters weapon, infantry support weapon, a pulse weapon, and the assault rifle weapons system. We've thrown in various attachments and accessories that allow for interoperability, plus several texture sets to choose from — a standard black, a generic green, a basic sand... and of course we had to do a hot pink version. I wonder why I'm not listed as a DAZ PA? Thank you so much for returning with such a nice gift! The new forum doesn't (yet) have an equivalent of a My Products button. You can put a link to your store in your signature as a stop-gap. lots & lots of LETHAL TOYS!!! with SPTs, too! And stuff that goes SPLODY-BOOOOOM! I downloaded Weapons Cache 1 and they look great. Unfortunately, DS 4.5 crashes on render when any of the weapons are in the scene. I even tried rendering just one of the weapons and this happened. Any advice for correcting this? I can't think of any reason it would crash. They are pretty straight forward figures and textures. I'll try to find some time to look into it this weekend. Things are kinda crazy at the moment. Thank you for looking into. I'm going to keep experimenting. If I figure something out I'll let you know. Thank you for not forgetting about us. It's great to be back in the swing of things. :cheese: Still buried by a huge backlog mountain, but we are slowly digging our way out from under the projects list. We're already working on several new products... so don't be surprised if something else comes out shortly. Looks like DS doesn't like my PNG files that I used for bump maps. You can detach the bump map as a workaround until I can get it fixed. I tried removing the bump map after loading it and still had the issue. I was able to render the minigun by renaming the png files and then loading the gun. Thank you for taking the time to look into this. ETA: Note, it's not DAZ Studio that's crashing. It's 3Delight/TDLMake that's crashing. ERROR: 3Delight Process exited abnormally: "E:/DAZ/DAZStudio4.64/bin/tdlmake.exe -mode periodic E:/Content/DSTemp4/d73.tif E:/Content/DSTemp4/d74_d73.tdl"
I just resaved the png files and they are working perfectly. Time to play!
. . . plus several texture sets to choose from — a standard black, a generic green, a basic sand... and of course we had to do a hot pink version. I'll bite -- why did you have to do a hot pink version?!? Not that I'm objecting, I particularly like the pink camo (reminds me of hunters in bright orange camo, which actually makes sense if your prey is colorblind). But why? The problem is that the PNG is in 4bit color mode. If you make it 16bit color, or even 24bit color, DS handles it just fine. Same for if you convert it to a JPG. Good to know. That will be a much easier fix. Note, it's not DAZ Studio that's crashing. It's 3Delight/TDLMake that's crashing. Interesting, but from a user standpoint a crash is a crash. So she can coordinate her outfit? I found a picture of a scantily clad woman. My wife says she is holding a pink gun but I don't see it. So it must be the ultimate camouflage. I don't think I can post the picture here so you will have to google "pink gun bikini" to see it. Pink has actually been used as a legitimate form of camouflage in the real world. During the second world war they painted reconnaissance Spitfires pink as it made it harder to spot against the sun and clouds and they also painted ships pink (with a slight gray tinge) in order to disguise them (though they did stand out rather during bright mid-day sun) as well as desert raiding SAS Land Rovers. And as WulfricF says it's so hard to co-ordinate ones outfit when defending ones turf and you need something that goes with that little pink number (though black generally does go with anything ;) ). Oh an instant purchase here. 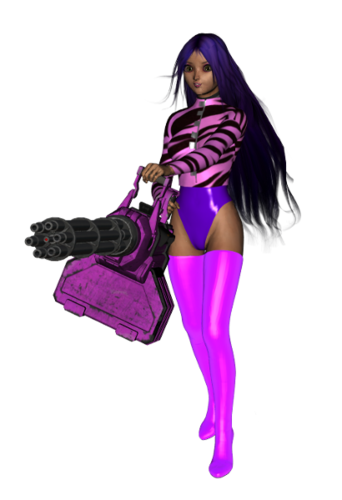 I wish I could remember, but I think it started out as a joke over on the Team-Dystopia forums... but then when the texture set first emerged for a number of weapons and people started using them in all these "bubblegum" pin-ups... it almost felt logical. We had a number of scantily clad female operatives with all sorts of gear painted up in pink, what's to stop them from customizing their guns? With that kind of firepower, not much. Yes, thank you very much to adamr001... I have cropped this error fix into our construction forums so that we can avoid problems of this nature cropping up in the future. Looks real great Buddy. Picked up both sets and plan on using them this weekend (if 'Real Life' doesn't get in the way). Looks great and glad to see you posting new stuff. Always liked your work. Love the idea of having a working accessory rail system! Good to see you again... drop by the forums when you get a chance. And, thank you very much for the support.